We’ve searched the universe for the perfect flowers to give to you while we celebrate this special night together– and we promise they won’t steal your energy!Our special corsages and boutonnières match the evening’s color palette with delicate white roses and a spray of lilac-hued limonium blossoms. 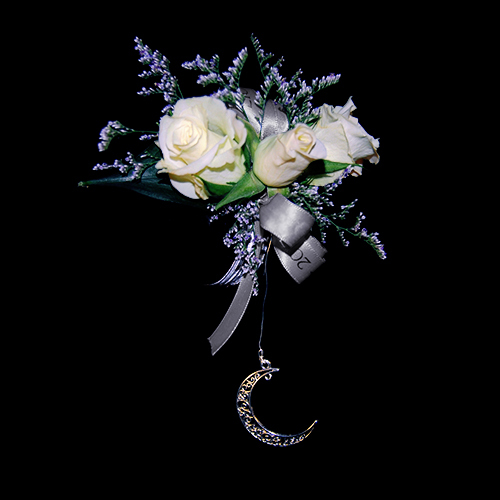 Both the corsage and the boutonnières come tied with a lovely silver ribbon that’s been personalized with “SMMB 2017” written on it, making these pieces a really lovely keepsake option! 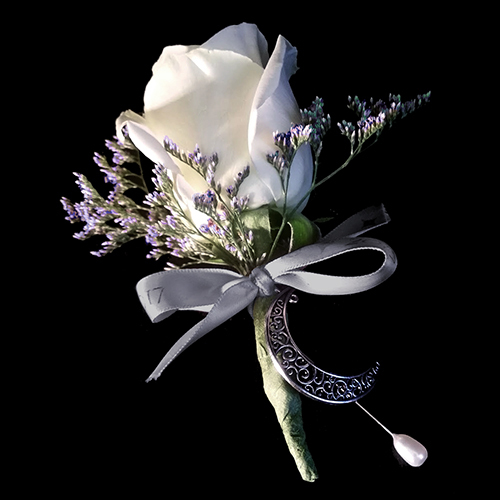 Each one is decorated with a pretty silver filigree crescent moon charm: on the boutonnières it rests tight against the rose stem attached to the ribbon, and on the corsage it’s fastened to a delicate silver wire so that it dangles gently down from your wrist– so elegant!